There are plenty of movers and shakers in the commerce industry, but so few of them get their due credit until they reach a particular tipping point at which their name becomes household. But many of these lesser-known retailers are building loyal, niche audiences that spread word of mouth marketing like wildfire –– allowing them to focus their efforts on site design, customer experience and innovative, albeit cost-effective, initiatives. Lesser-known retailers are earning loyal fans that spread word of mouth marketing like wildfire. After all, this is no dot com boom era a la the 90s and early 2000s. Successfully scaling businesses must keep an eye on revenue and ensure profitability. For the entrepreneur or businessperson within each of us, however, these businesses are the grit and grind reality checks needed, reminding us all that success is attainable –– but rarely without hard work, daring leaps of faith and admirable persistence. Below, you’ll find the top 12 retailers to watch in 2016. They might not be household names just yet, but they are so very close to that tipping point. HD Buttercup is a high-end furniture store well-known in the Los Angeles area. The company currently has five brick-and-mortar locations, and is actively expanding their physical footprint. Outside of LA, however, the company has remained relatively unknown. In 2015, after an extensive site audit revealing a bit of the why behind a lack of online awareness (hint: the company’s SEO was working against them), the team decided to seriously focus on bringing HD Buttercup to the visibility of the world wide web. The HD Buttercup website has reported more than a 10,600% increase in organic traffic. The site relaunched in November 2015, with improved SEO as well as a synced inventory feed populating their products within Google Shopping. Thus far, the HD Buttercup website has reported more than a 10,600% increase in organic traffic, but that’s not all. Site engagement is up as well: 22% more unique users are having sessions of five pages or more –– an increase of 9.9% on their older site. And best of all: transactions are up 50%, producing 40% more revenue for the brand and allowing them to reinvest in marketing and advertising (the ROI of which is up 550%) to further increase brand awareness out of the LA area. Keep an eye on these guys –– it’s likely you’ll be shopping from them if you’re in the market for new, quality furniture. See the HD Buttercup store here. Some might say that 2015 was LaQuan Smith’s year. After all, he was named on Forbes’ Top 30 under 30. But let’s be clear: Smith is just getting started. This up-and-coming fashion star’s pieces have graced the likes of Beyonce, Nicki Minaj, Rihanna and the Kardashian clan and Smith has already begun to see an influx of online revenue due to the increased notoriety. “The sales skyrocketed,” Smith told Vanity Fair after the Kendall Kardashian instagrams one of his designs. Of course, it isn’t just unpaid influencers and celebrities buying into Smith’s style point of view. Fashionista, a leading fashion publication, calls his Spring 2016 collection “Chanel-like” and Bustle, a women’s interest online publication, deemed his pieces “sophisticated,” encouraging those looking for a new beloved designer to check him out. Indeed, Smith, a Macy’s Workshop graduate, racked up quite a list of positive press moments in 2015 –– and when you see scaling growth like this, you know Smith has more tricks up his sleeve for the new year. Stay tuned. See his store store here. It’s difficult to standout in the fashion retail industry. OK, it is difficult to stand out and drive awareness in any vertical, but the fashion retail industry is its own beast. There are thousands of competitors in the space, keywords for cost-per-click campaigns are expensive and you are forever competing both with legacy brands like Macy’s and Forever 21, as well as potential industry disruptors like Rent the Runway or Stitchfix. Yet, despite the challenges, Modern Vintage Boutique has come out on top over the course of the last six years. Modern Vintage Boutique has nearly 1.5 million online fans. Launched in 2010, the team has strategically utilized social media platforms to grow their audience and push potential customers back to their site. Following on the heels of their success, the team launched an additional brand in 2013 for children’s apparel. Today, Modern Vintage Boutique has nearly 1.5 million online fans and launched the new year with a Facebook Shop section –– one of the first non-legacy brands allowed to do so on the platform. This company’s growth is mesmerizing, but their ability to connect with their customers is their superhuman strength. All brands could learn a little something from their strategy, honesty and camaraderie. See their online store here. The athleisure trend took off in 2015 –– and the associated brands were quite predictable: Lululemon, Athletica, Nike. But, there are plenty of other athleisure brands on the rise started by Yogis and trainers alike. These are the people who know exactly what it takes for a material to truly qualify for athleisure –– that is, of being both comfortable, breathable and pliable no matter your activity level. One such brand is Onzie –– whose eclectic yoga pants got them a mention in the Wall Street Journal. In fact, it is their eclectic collection of athleisure items that makes this brand one to watch in 2016. Customers love both the high quality and the fashion-forward designs –– and the team is continuously building a long list of celebrity influencers as well as digital fans (nearly 150K thus far). With the continuously busy lives of professionals in the U.S. and around the world, athleisure is likely a trend on its way to becoming a staple –– and Onzie is quickly gaining status with the fashionistas in that industry. See the Onzie site here. From deep in the heart of the American midwest comes Two Guys Bow Ties, a success story to which even the sharks on ABC’s hit show Shark Tank couldn’t say no. Their product is simple, in theory at least: wooden bow ties. These ties don’t wrinkle. They aren’t difficult to tie. And best of all, they can come customized. Sure, the idea may sound weird at first, but take a look at a few of the company’s pictures, or those submitted by customers, and you’ll soon see that wearable wood is having a moment –– and the bowtie is to thank. In 2015, the team earned a $150,000 investment from Daymond John, and subsequently opened their very first brick-and-mortar store –– right in their Tulsa hometown’s downtown. Like all great entrepreneurs destined for success, Teague and team look beyond themselves and the company to gauge what is working –– and what isn’t –– within the market. It is this resilience and curiosity that drives the innovation behind Two Guy Bow Ties, and a big reason why they are making this list. .#SharkTank @Bigcommerce We started Two Guys in our garage back in 2012 and it has been such a ride! So, if you’re planning a visit through Tulsa –– stop on by their new store. Otherwise, check out their online shop and keep an eye on their hockey stick growth. The internet was abuzz when Mark Zuckerberg, founder of Facebook, announced that he and wife, Priscilla Chan, will be giving 99% of their wealth to their new baby girl. It wasn’t just this announcement, though, that caused a stir. Instead, it was in how he was planning to uphold this promise –– by launching a limited-liability company aimed at catering to charity and returning all profits back to the business to help grow it and make it more effective. And while Zuckerberg’s move is certainly interesting –– there are nonprofits out there already doing just this. Meet Stupid Cancer, the “dominant youth cancer non-profit” according to MTV. Stupid Cancer is run by a passionate Mr. Kenny Kane –– the likes of whose writing you have probably read either on this blog or other ecommerce trade publications. Kane is the energizer bunny sitting at the cross-roads of the non-profit and ecommerce worlds. Kane is an ecommerce mogul if there ever was one. He manages Stupid Cancer and their online store, speaks at ecommerce, non-profit and cancer awareness events nationwide, writes for multiple ecommerce publications, sits on the board of YNPN NYC –– a non-profit professionals organization in New York City –– and finished out his 2015 year ringing the NASDAQ bell. And Kane has much more up his sleeve, with plans to launch a podcast and collaborations in the works with other entrepreneurs. It’s safe to say he is the energizer bunny sitting at the cross-roads of the non-profit and ecommerce worlds. Keep an eye on him –– because passion that amped up doesn’t go unnoticed for long. See the Stupid Cancer online store here. Fugoo is one of the coolest, wireless speakers you’ll come across –– and the industry is starting to take serious notice. In 2015, the team forged a holiday deal with Best Buy as an exclusive distributor. But, don’t fret –– as of 2016, you can find Fugoo’s in stores throughout the U.S. Beyond the awards the product keeps winning and the bigger brand collaborations in place, Fugoo is a brand to watch solely for its marketing and on-site experience. With various speakers designed for varying individuals and lifestyles, beautiful product and lifestyle photography and a seamless site navigation –– Fugoo wins merely for making the on-site experience so cool. Check out the Fugoo site here. It was only in 2014 that Badass Beard Care founder Charlie Moyer went from $30 in revenue to $30,000 –– in three months. Since then, this up and coming company has only seen hockey stick growth. What makes this story so great, though, is Moyer himself. With no ecommerce experience, no SEO effort and only a frustration, and the passion to solve it, regarding the then beard care market ––– Moyer has build an insanely successful online store simply by following his gut. I didn’t even know what SEO was. Today, his site ranks as one of the top results for searches regarding beard products on Google. And, he’s spent very little money gaining that standing, or on any marketing or advertising at all. Word of mouth is how his loyal customer base has grown –– and succinct product descriptions and an experiential site customers don’t bounce away from have given him everything he needs to rank well on Google. Don’t be afraid to double up when you hit a bit of success. In 2016, with a new subscription box service, be prepared to see this brand rise to the ranks of household name status. Check out the site here. In 2010, Kelleigh and husband Brandon found a coffee farm for sale in Hawaii. Sitting in their West Coast home, they made the decision to fly out to see the property. Weeks later they had bought it and were planning a move out to the island state. Over the course of the next two years, the duo self-taught themselves the art of cultivating, processing and roasting coffee. In fact, when the farm was first sold to them, the previous owner had little to no hope for the coffee section of the farm. Instead, he said that the flower business would be their main, small income. But they were undeterred. In 2013, their collaborative and creative efforts began to pay off –– and their coffee began to win some seriously high-profile awards. Our end-goal was always the same: the objectively best coffee we could produce from our land. 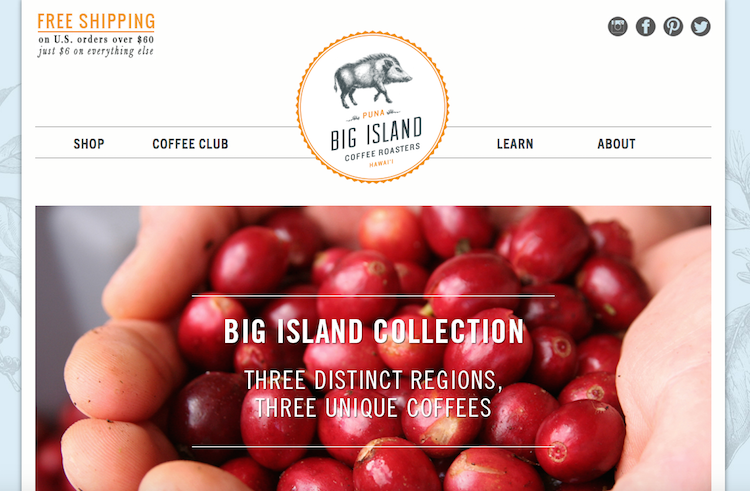 Today, the company is gearing up for possible acquisitions and is dedicated to raising awareness of the high-quality Hawaiian coffee production they have nurtured since their move to the state. Keep an eye out for them –– and sign up to give their coffee a taste. You can check out their site here. Launched by Garrett Ozar, Bigcommerce’s sales development manager, in 2014, AmpCaddy is a portable bluetooth speaker designed to accompany you to the golf course. It wasn’t until the 2015 holiday season, though, that the team and inventory was ready for any marketing or advertising spend. In November, targeting the Black Friday through Christmas shopping season, they launched their very first Facebook campaign and sales shot through the roof. As of today, AmpCaddy has been recruited by Google to join their emerging brands program, is experimenting with social commerce and is planning a redesign on Bigcommerce’s Stencil framework. Consider this store a Bigcommerce darling the entire company is rooting for –– and keep an eye out for what happens over there. With a bit of insider access, changes you see on that site may very well be available to the general customer base very, very soon. See the AmpCaddy site here. The Simple Shoes brand was purchased by a large footwear company and closed its doors in 2010, according to their about page. The brand then laid dormant until a passionate group of footwear people, including early Simple designers, brought it back to life in October of 2014. These days, the team is busy working to bring product back from the past and to build relevant product for the future. Those that know the brand are passionate about the simplicity and utility of the product –– and the new team is dedicated to building the brand to household name status. This time around, there won’t be any selling to larger companies. With a success story already behind them, this team is gearing up for a big 2016 –– with new designs inspired by modern trends and traditional popularity. Check out the Simple Shoes site here. Drink Dispatch is a brand utilizing the disruptive nature of today’s delivery services to gain loyal customers. How? By delivery alcoholic beverages to consumers in under an hour. Few other companies can boast such a quick turnaround time frame. In fact, Amazon is one of only other brands to do so. Based out of St. Louis, Drink Dispatch deliveries in multiple municipalities and has been successful everywhere they’ve launched. Currently, their biggest dilemma is awareness, but with little spend on any advertising or marketing, this young company is just getting their feet steady beneath them. Expect to see rapid growth from them in 2016. You can visit the Drink Dispatch site here. Do you have a favorite store or brand that you think is on the up and up? Add them in the comments below and let us know why they’re a brand to watch in 2016.